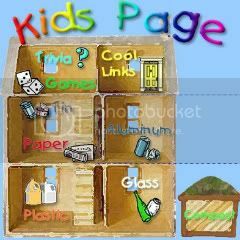 We made sure that we can gather, in one location, as many links as possible to the most popular and coolest kids’ recycling sites in the web. If you’re a parent or teacher reading this, please take a look at our new site, Recycling for Kids. I’m sure there’s something in there each of us can use next time we try to explain to the kids what recycling is, or what composting is. I’d also appreciate it very much if you can post here your own ideas on how we can improve the lens. Personally, with my own kids, I approach the subject of recycling through the easiest route, the three R’s – reduce, reuse, recycle. Valerie, my 13-year old, loves posters, trinkets, and faux jewelry like any other normal teen. But she knows recycling, for our family, starts even before we go to the grocery or the department store – no unnecessary and wasteful purchases and buy only things you can reuse or recycle later- that’s how we brought her up. Today, she designs her own posters and creates these beautiful pendants or ear pieces from materials she already had in her kiddie jewelry box. And what’s really cool about it is she’s also influencing the other kids to get creative in refashioning old stuff into new designs they all can rave about. When kids get into the recycling groove, they’re simply unstoppable. They just refuse to take no for an answer. Every time I look up how the kids in this country are measuring up to other kids from around the world when it comes to recycling, I can’t help but feel pride and hope for them and for all of us. Take for instance, the kids from Parkmead Elementary School in Contra Costa county, who successfully conducted a cell phone collection drive in their community, last year. They did that to benefit children from developing countries who were born with cleft palates. The kids from Ruthlawn Elementary School in West Virginia, who refused to take no recycling for an answer, are just as heroic. This happened after the recyclables industry was hit hard by the financial crisis late last year, and their county’s sanitation department announced that it was stopping its recycling collection activities. The kids went out and wrote letters to everyone, from the governor to their city mayor, who can make the right decision. Eventually, they got what they wanted – the county continued to collect the recyclables in their area. The Recycling for Kids lens is, of course, a work in progress. If you want to add something or know of a site that’s also promoting recycling and environmental protection to kids, please feel free to leave a comment here or at the lens, and I promise to take a look at your site for possible listing in the lens. Your feedback, as always, is most welcome. Credits: Image courtesy of the Washington State Department of Ecology Kids’ Page. I love helping the Earth. Well, we only have one, so lets make it the best we can!